Eating With Fingers: Is okay as long as what you are eating does not have any fillings. The main point here is that it is important that you keep your hands from looking like you rummaged the food and the people around you might find it disgusting if you insist. If a food has too much sauce or fillings on it, feel free to use a fork instead. Be Organized: If there are different foods laid out on the table, it is a sign of good manners if you eat in the following order; start with the scones or what people commonly refer to as muffins; then move to the small sandwiches next and last, would be the sweets. Keep in mind to leave the dessert as your last stop. Scones and Muffins: When eating scones or muffins, you can choose to break a small portion of it then put a small amount of butter or jam on it. If there is clotted cream available or Devonshire, you can sprinkle a bit of it on your muffin. Remember that this cream in particular is not to be used to enhance the tea’s ‘flavor. Eat Properly: When eating sandwiches, refrain from having a big bite. Doing so may give people the impression that you are really hungry and that you do not have any bearings or manners to keep yourself composed. Always think about composure when eating even if what you are eating is small. 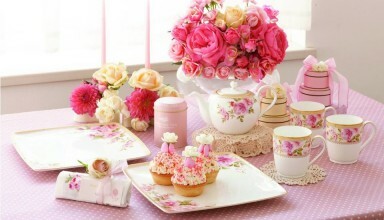 Almost all the tea parties around the world follow some sort of good manners and right conduct. So if you will be having a high tea party in Sydney, do not forget to uphold these guidelines. Step 1: Know your budget. This is important because the materials that you will be using to make a Hanukkah gift basket depend on how much you are willing to spend. Furthermore, this makes sure that you do not buy something unnecessary which may upset your overall budget. Step 2: It is important that you figure out what particular item will you be basing the basket’s theme on. This is usually the most expensive item you will be putting in the basket and at the same time, the main gift. If it is for an upcoming Hanukkah celebration then a menorah is a good start. Step 3: Buy accessories and add them on the basket as a form of decorations. Just make sure that the accessories are theme-related so if you are making a Hanukkah gift basket then menorah candles would be a good pick. Step 4: Make sure that you have a specific color scheme when making the basket. Just putting random colors may make it more ugly than beautiful. Step 5: It is always a good idea to include a gift which can be eaten by the person you plan to give the basket to. 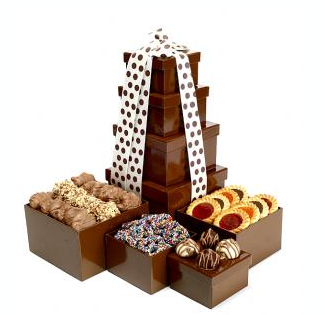 Chocolates are often the ones commonly placed in the basket. Step 6: Buy a basket which is big enough to accommodate every other item you plan to put in it. Keep in mind that arranging the items in a way that they will all be visible to the naked eye makes it look better. Step 7: Hold the basket together using a cellophane wrapper. Use wrappers that are big enough to accommodate the whole basket. Use a ribbon to tie the top of the basket and then put a name tag along with the name of the person whom you will be giving the basket to. If you have a knack for chocolate cakes but do not have the luxury of time baking a whole lot of them, then you can go for a quick baked molten chocolate cake. Step 1: What you need to do first is to preheat the oven to 325ºF. After doing so, grease the two large ramekins which are around three inches big with butter and the pour or dust the cocoa on it. Step 2: Melt the chocolate and the butter on a saucepan. The egg on the other hand needs to be whisked together along with the egg yolk and sugar until the color becomes pale yellow. Mix them in a large mixing bowl so you have enough space to stir the egg. Step 3: Temper the egg mixture with the chocolate and butter mixture before completely mixing the two together. Add the flour next while you are gently mixing everything. Step 4: Equally pour the mixture next into the ramekins and bake them for twelve to fourteen minutes. 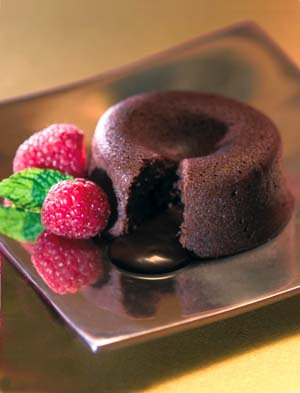 After this timeframe, unmold and the chocolate molten cake is now ready to serve. A cake cover help you if you need to temporarily store your cake before the party. This recipe is good for two people and perhaps one of the easiest available. This works great if you want to bake for someone special.